North Stradbroke Island is a nature lover’s wonderland, with pristine beaches, rugged landscapes and picture-postcard views – an untouched wilderness overflowing with wildlife and marine creatures right on Brisbane city’s doorstep. Straddie is teeming with marine life – from huge schools of eagle rays and batfish to the tiniest nudibranch – and there’s no better way to experience these incredible creatures than up close in their own environment.Whether you go snorkelling along the Amity rock wall, off one of the rocky headlands at Point Lookout or opt for a short but exhilarating beach-launched boat trip off Point Lookout to one of the nearby reefs, rocks or bommies to scuba dive, you’ll experience some of the best dive sites in south-east Queensland. 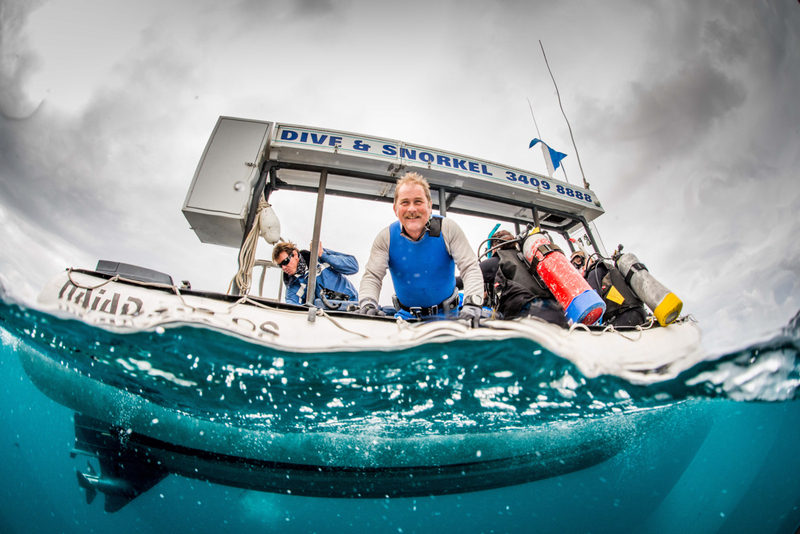 It’s not unusual to have 20m of clear visibility and get right up close to wobbygongs, turtles, shovel-nose rays, bull rays, leopard sharks and, depending on the season, the majestic manta rays or grey nurse sharks. If you’re lucky enough, a whale shark might even cruise on by. I learned to dive on the island and have now been on more than 50 dives. Every time is different, and everyone should dive with a manta ray at least once in their life. Bring your fins and mask, head to one of the many rocky headlands or contact Manta Lodge and Scuba Centre on 3409 8888. A double dive starts from $140. Another great way to experience the island’s marine life is on a kayak or stand-up paddleboard. It really is incredible how much you see when gliding over the water without a motor. If you are lucky you might bump into dugongs, dolphins, rays and turtles, along with plenty of fish and birdlife. A favourite spot is up Wallum Creek at high tide. The mouth can be found if you look closely when heading across the bay to the south of the Amity jetty. When the ocean is calm, the more experienced can head out to Shag Rock, or take a relaxing cruise through the reeds on Brown Lake and revel in the tranquility of the area. If you don’t have your own kayak or SUP, do a SUP lesson with Straddie Stand Up Paddle, starting from $50, or go on a kayak adventure and authentic Aboriginal culture experience with Straddie Adventures on 0433 171 477. Prices start from $50 for a child and $135 for an adult. 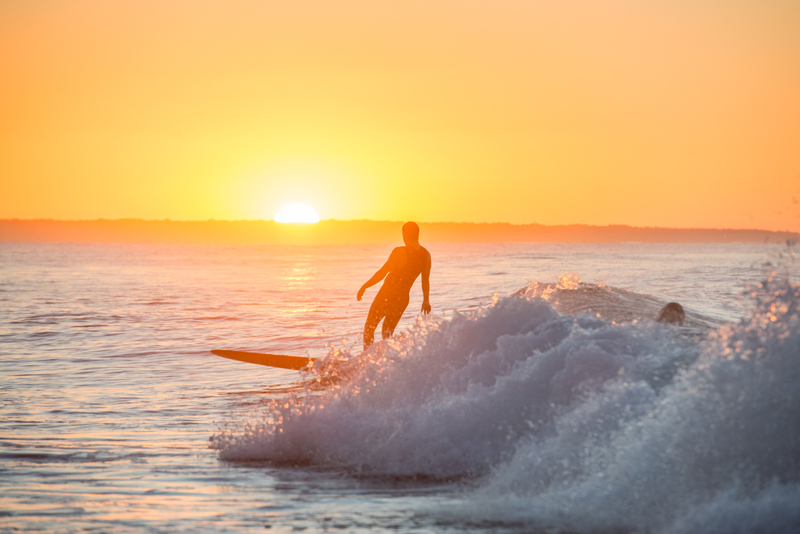 Surfing is a huge part of the island’s culture and when the surf is good, the vibe is amazing. At such times it’s not unusual to find many of North Stradbroke Island’s residents sitting on the headland watching the action. It’s better than anything you’ll see on TV. With crystal-clear water, clean waves and acres of white sand, it’s a surfer’s playground, and as an added bonus they’ll often see whales breaching on the horizon, eagles hunting above or dolphins sharing their waves. As an island with north and east-facing beaches, no matter the weather conditions there’s usually a wave to ride. And forget about getting cold – the water temperature doesn’t drop below 19C in winter and rises to a tropical 27C in summer. 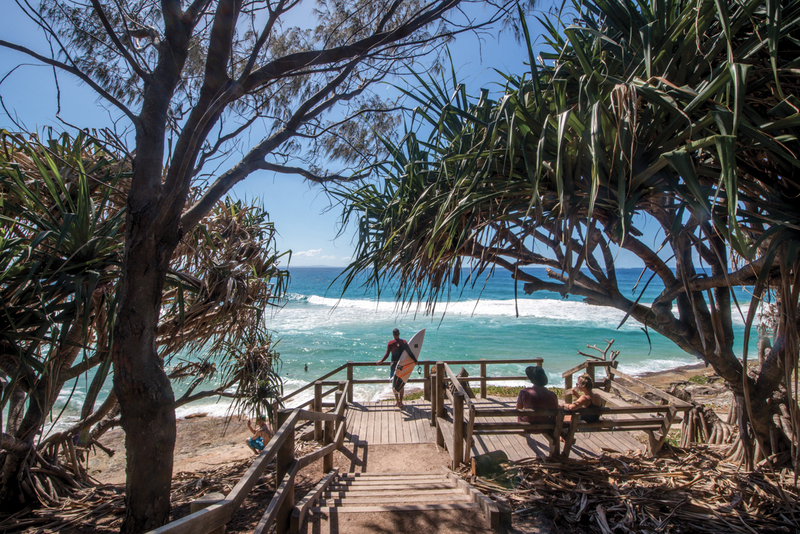 When you do get out there, be sure to take a good look around – you could be rubbing shoulders with some of the world’s best surfers, with big names such as Bede Durbidge and Ethan Ewing calling North Stradbroke Island home. 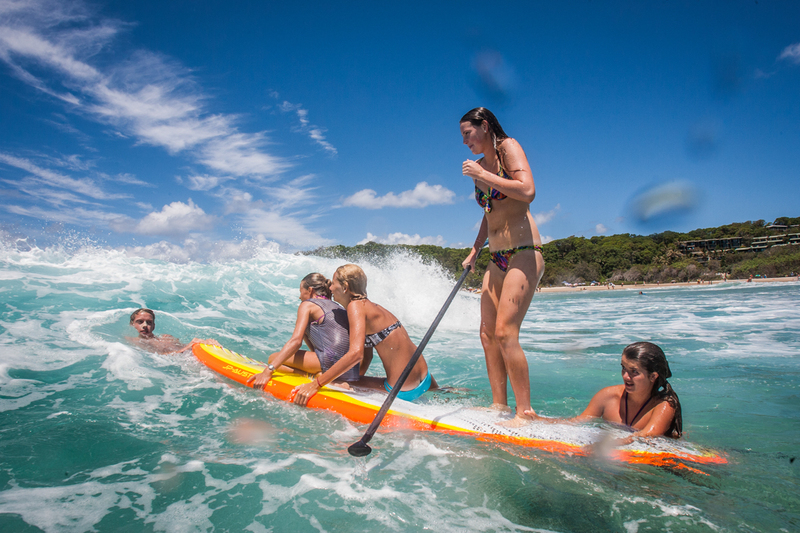 Bring your board and paddle out to one of the many breaks, or tick off one of your bucket list items and learn to surf with North Stradbroke Surf School on 3409 8342. Lessons start from $50. Make sure to pack a fishing rod when heading to the island. Mangrove-fringed waters on the western side, spectacular stretches of beaches to the east, rocky headlands at Point Lookout and a deep channel within casting distance of the Amity jetty offer keen beach anglers plenty of choice year-round. Tailor, whiting, bream and flathead just some of the species you could find at the end of your line. There are two public boat ramps on the island which provide access to amazing reefs, sand banks, holes and secret spots. Some of the best offshore fishing in south-east Queensland can be found on Straddie and angler can also catch snapper, jewfish, parrotfish, tuna, sweetlip and mackerel, among plenty of others. We owe countless dinners to our neighbor who shares the spoils of a day’s fishing with us – prawns, snapper and plenty of other ocean goodies passed over the back fence. The taste can’t be described. Experienced fishermen should have no trouble bringing home a fresh-caught dinner, or you can head out with professionals Mal Starkey’s Fishing Tours on 3409 8353 or 0407 376 091. A day’s fishing starts from $250 (a minimum of six people is required). To fully immerse yourself in North Stradbroke Island’s spectacular natural environment, head off on one of the many walking tracks that crisscross the island. There is a walk for every fitness level – from short, easy boardwalk strolls and relaxing beach ambles to longer moderate hikes, as well as the chance to scramble up rocky outcrops for stunning views. I love hiking and there’s always a new walk to discover. There is nothing better and more peaceful than getting back to nature and being among the trees. A must-do is the renowned 1.5km gentle Gorge Walk, which winds along the Point Lookout headland and showcases the rugged, untouched island landscape. You’ll see kangaroos eating dinner perched on the clifftops, koalas sleeping in gums and turtles coming up for air. Half of the island is gazetted as national park and offers treks through lush rainforest, native bushland or past stunning ocean views and world-class scenery. There’s an easy 5.2km return walk to Blue Lake (Karboora in the local language) and a 6km return moderate lookout track offering views over the southern part of the island and Pacific Ocean through to the Gold Coast. You may be lucky enough to hear the call of the threatened Cooloola tree frog or spot a golden wallaby, which is only found on three of the bay islands. Imagine stringing up a hammock right beside your tent and overlooking the ocean, sipping a beer or glass of wine with your special someone and looking up every now and then to admire the spectacular view – all without another person in sight. It can be more than just a dream at one of the many bush camping spots along the extended stretches of island beaches. 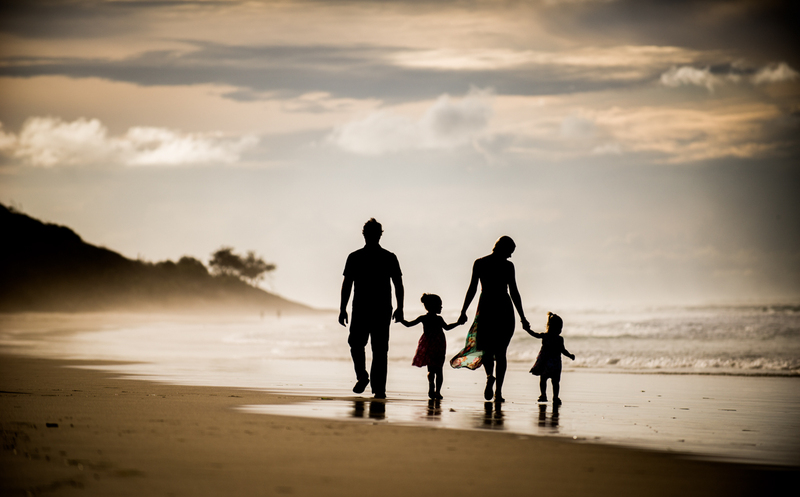 Pack up your car and unwind with the sights and sound of nature, the stress-free joy of simple living and sand between your toes. 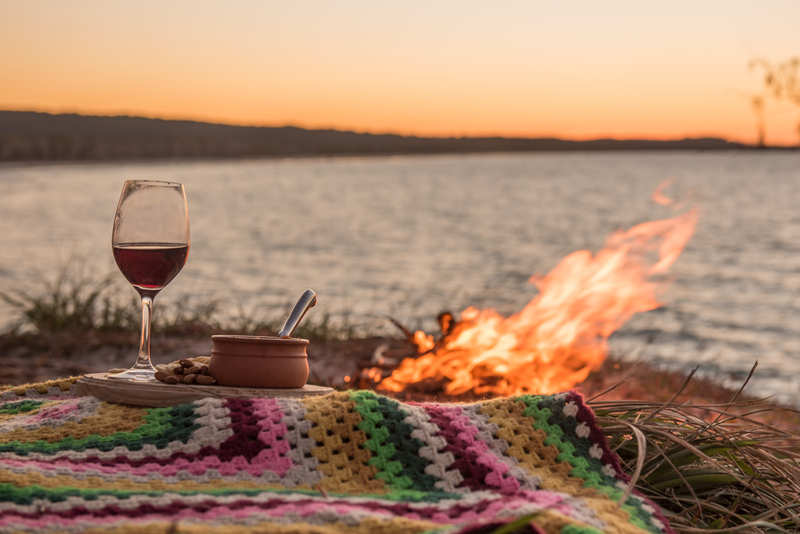 Nothing beats sitting around a fire with your mates – and your dog – watching the sun go down and waiting for your freshly caught fish to cook on the coals. 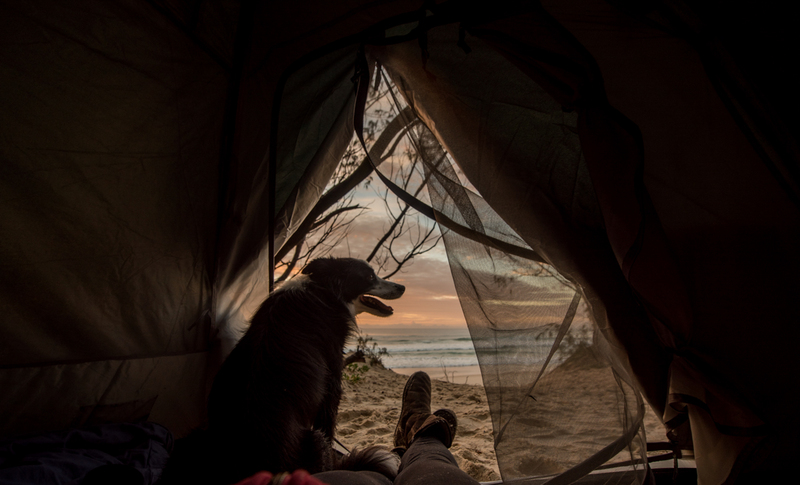 Even though we live just 10 minutes down the road, my husband and I, along with our dog, can often be found at our favourite camping spot, watching the waves roll in and feeling like we’re the last two people on Earth. To book your campsite or a 4WD beach-driving permit contact Straddie Camping on 3409 9668. Campsite prices start from $18.85 per night. Have you ever seen a 16m, 3.5 tonne humpback whale launch itself out of the water? It’s a sight to see and something you’ll never forget. If that wasn’t enough, you may also spot a calf following its mother’s effort with a little breach of its own. It is truly is one of life’s ‘wow’ moments. Straddie is well-known as one of the best land-based whale-watching sites in the world. It is the ideal spot to see these majestic creatures on their annual migration between Antarctica to their calving grounds in the southern Great Barrier Reef and back down the coast again, with their calf in tow, right past the eastern-most tip of Australia. From May to November, find yourself a perch at one of the many vantage points along the headland at Point Lookout (bring some binoculars if you want to get an even closer look) and settle in for an extraordinary show. See them in all of their glory yourself or contact marine biologist Dr Olaf Meynecke, who runs guided walking tours. Ask anyone on North Stradbroke Island about their favourite place to watch the sunset and you’re unlikely to be given the same spot twice. There’s so many places to watch that magical moment of the day that you may have to extend your stay to try a few different ones. 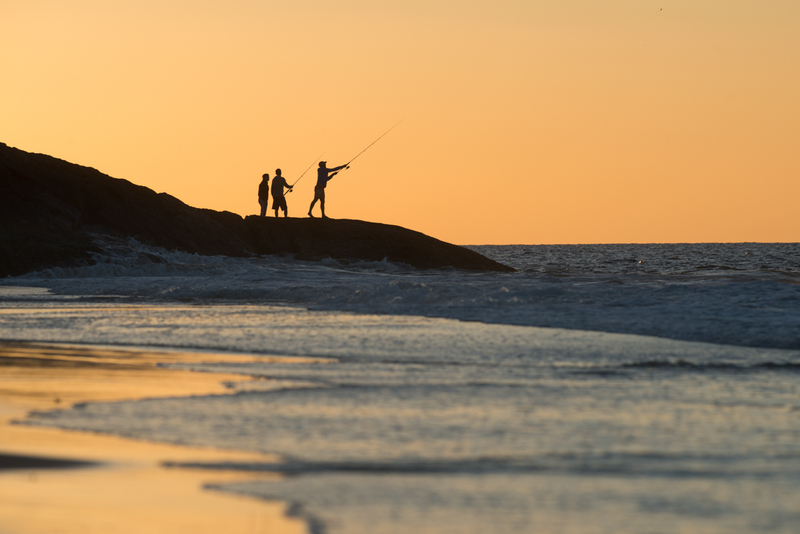 Amity Point offers a perfect vantage point, with fishermen casting off the rocks, pelicans perched on pylons and dolphins cruising the waters as the sun sets over the ocean. The Flinders Beach side of Adder Rock is also a favourite, with surfers catching their final waves as the last of the day’s rays stream up the long stretch of beach. Or you may prefer One Mile Beach, where anchored boats are silhouetted by the setting sun. There’s never a bad sunset on a paradise island. It is one of the things I love best about life on Straddie. ‘Sunsetting’ has become an art form practised by the island’s residents. It can be as simple as relaxing quietly by yourself to enjoy nature’s show or catching up with a group of mates and making the most of the moment. Essentials for such events include a basket stocked with a blanket to sit on, a bucket of fresh local prawns and glasses for the mandatory bottle of champagne to share with your fellow sun worshippers.